The head of the American Lo-Sze Pugg™ should not look large for the size of the dog, but should show broadness. The skull is wide and flat between the ears and wide between the eyes. The stop is deep. The nose may be any color and is wide with open nostrils. The eyes are large, round and may be any color. The ears are set high and may be either drop or rose type. Drop ears fall to just below eye level. The muzzle is very short and broad. Nose wrinkle is preferred The chin must be undershot with an upward sweep. The incisors of the lower jaw protrude over the upper incisors and the lower jaw is rather broad and strong. The neck is rather short and moderately thick. The body is rather long and stocky with a broad chest and a level topline. The forelegs are curved, set moderately wide apart and short with a good bone substance. The hind legs are slightly lighter in bone substance than the forelegs, but are firm and well-shaped. The feet are large, flat and not round. The forefeet are slightly turned out. The tail is set high, carried over the back and may rest on either side. Two coat types are allowed, the preferred being short, soft and smooth with or without an undercoat. The undesirable, but accepted coat is long with feathering on the ears legs, tail and toes; it may be any color or pattern. As small as the American Lo-Sze Pugg™ is, it has all the love to give that a larger dog has, but it is more compact, as well as easier to lift and transport. It tends to be very sociable and tolerant of other pets such as cats and birds. It is a winsome little clown ready at all times to be your jester and it is a truly enchanting companion of ancient lineage. It shows a relatively high level of intelligence and responds well to both obedience training and social tricks. It is good with children, although some may be reserved around strangers or in unfamiliar situations. Socialize well. As with any other dog, interaction between it and small children should always be monitored. It will usually bark as an alert that it finds something suspicious, however it does not bark randomly. Because of its size and temperament it is not able to act as a watchdog. Affectionate and lap-sized, it is a hit as a therapy dog. To avoid behavior issues, do not allow this breed to develop Small Dog Syndrome, human induced behaviors where the dog believes he is pack leader over humans. Always be your dog’s calm, but firm, consistent, confident leader with a determined, loving approach. Dogs thrive when the rules are made clear. Some of the health problems found in the American Lo-Sze Pugg™ are lacrimal duct atresia, cleft palate, inadequate blinking, patellar luxation, umbilical hernia and stenotic nares. 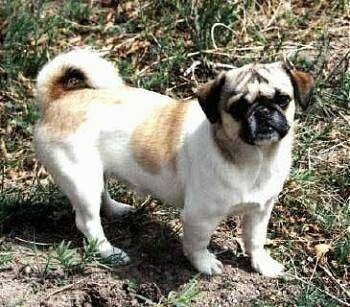 The American Lo-Sze Pugg™ is a brachycephalic toy breed like the Pug and Pekingese, and as such might have other problems found in those breeds. These problems include the ones already mentioned as well as cataracts, distichiasis, elongated soft palate, retinal atrophy, cleft lip and hip dysplasia. Because of their short nose, this breed can overheat very quickly. If overheating occurs the best thing to do is pour rubbing alcohol over the dog's body (cool water will also work but not quite as well; never use wet towels) and blow air over it with a fan or even better, an air conditioner vent. If the dog has a blue tongue, oxygen is needed. In this case, continue cooling and take it to the vet as soon as possible. If the situation is under control keep the dog in a cool, quiet place and check its temperature regularly for 24 hours. If the dog’s temperature goes over 106 degrees damage to the brain may occur. American Lo-Sze Puggs™ are suitable for apartment life. They also do well with a small yard but must be kept as indoor pets. They can easily stay fit by just doing the normal things in life, however, they still need to be taken on a daily walk to fulfill their canine instincts. American Lo-Sze Puggs™ do enjoy playing fetch. Care should be taken when exercising them so they do not become overheated (see Health Problems). A weekly brushing and an occasional bath are all the grooming that is necessary. Created in the U.S. as a reconstruction of an extinct Chinese breed, the earliest evidence of short-nosed dogs in ancient China include mention of short-mouthed animals by Confucius in 551 B.C. Records from the first century A.D. refer to Pai, which appears to mean a short-legged and short-headed dog whose place was under the table. In the dictionary of Chinese characters commissioned by Emperor Kang Hsi around 950 A.D., references to dogs with short legs and dogs with a short head are included. These animals were exclusively kept by members of high royalty. Breeding of these dogs were permitted only within the Imperial palaces and any person found in unlawful possession of one met with execution. Illustrations of these dogs are found only in the stylized drawings and scrolls of ancient Chinese art. It appears that by the 1300s three types of small dog were favored. First was the Fu Lin, remarkably similar to the breed we know today as the Pekingese. Second was the Shoku-Ken, thought to be the ancestor of the Japanese Chin. Third was the Lo-Sze (low-tsu), progenitor of the modern Pug, sharing many characteristics of the Pekingese, except that its coat was short and the tail was without feathering. The color of the Lo-Sze varied with most being parti-colored, while some were almost completely white. The Chinese had interbred these dogs, resulting in both short and longhaired versions, as well as variously colored pups in the same litter. During the latter part of the 1500s and early 1600s China began trading with European countries such as Portugal, Spain, Holland and England. The three types of Pug dogs returned from the Orient with these traders. By the beginning of the 1800s, the breeding of these small dogs outside their native home became more standardized as a breed, with favor toward the longer legged fawn and black Pug we know today. This allowed the genetic traits of the Lo-Sze, among others, to be slowly lost. In 1989 Rebecca Manns began researching the history of today's Chinese Pugs. She learned how the colorful, short-legged ancestors were allowed to be lost in favor of the taller fawn and black animals. Finding it a pity that the original royal Lo-Sze was changed to suit another country's liking, she began to reconstruct the Lo-Sze dog of ancient China. Recognition was gained in 1998 under the present name by the International Rare Breed Dog Club Registry.